What kind of Occupational Therapist would I be if I let the entire month of April fly be before giving a shout out to my profession of the last 17 years?! April is National Occupational Therapy Month!!! As a student, we were told that we needed to have a few versions to explain what the profession is and does… the elevator version, the polite conversation version and of course the more in depth version. This was sort of puzzling… how could people not know what OT is?! The profession has been around since the 1790s actually. During the Age of Enlightement, both a French doctor named Philip Pinel began advocating for a different way to work with people diagnosed with mental illness. 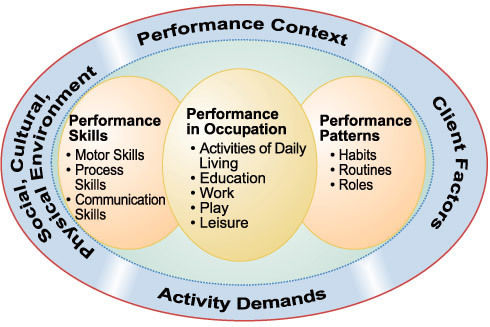 He called it “Moral Treatment and Occupation.” Within this model, occupation began to be know as “man’s goal-directed use of time, energy, interests, and attention.” Based on this premise, Pinel began to use literature, music and physical exercise to heal emotional stress and therefore the mind, allowing the body to perform everyday task that make us “functional” human beings. Around the same time in England, William Tuke also began advocating for different ways to help those placed in asylums. His basic premise was to treat all people with respect and kindness. (Crazy huh?!) He prescribed occupations, religion and activity with purpose as a way to help heal the mind and body. He employed “leisure activity” aka hobbies to help patients learn and grow. He simply adapted the activities to where they were with a slight challenge thrown in to allow them to be both successful and to feel accomplished. During the 1840-1860s you could see these approaches combined in the United States. Arts and crafts became quickly associated with the profession as the Arts and Crafts Movement began to flourish. The “moral” treatment of individuals began to fall by the way side however with the Civil War depleting resources and morale. In the early 1900s, a resurgence was felt for the ideals of the profession with the first association, the National Society for the Promotion of Occupational Therapy (NSPOT) being founded in 1917. The profession flourished and during the 1920s and 1930s more closely aligned itself with the medical profession. World War I and World War II once again called for the services of members of the profession as injured soldiers were surviving their wounds and learning to live productive lives after service. It was during this “Rehabilitation Movement” that Occupational Therapists gained their name used today. As medicine changed from then until now, so too did the Occupational Therapy profession change. Medicine became more specialized, as did Occupational Therapy. Today, you can find OTs working with people from pre-maturity into older adulthood. You can find them working in schools, hospitals, clinics… you can find them working with veterans and with at risk youth. You can find them on horseback, in pools and playing cards. You see, we serve the people we work with… so our face and our hats change frequently. The person sitting in front of us, needing our help, has their own goals, their own unique set of family, work and personal experiences and responsibilities that make them who they are. I remember interviewing my husband’s grandmother about Occupational Therapy for my Older Adult class. She was 92 at the time and had outlived 3 hip replacements. Each time she was ready, she worked with an OT to help get her up and independent again. The OT had been there that morning in fact and Grandma had been able to stand at the sink and peel potatoes for dinner for 3 minutes. She looked at me and said, “The nice OT told me I did a great job and was on my way to making dinner myself again soon. I didn’t have the heart to tell her that I haven’t made dinner in over 30 years.” HA! No two sets of responsibilities are the same… don’t let anyone tell you otherwise. So let’s take me as an another example… I am a Mom to 4 kids… so I cook, I clean, I do laundry, I drive, I organize, I shop, I bathe myself and my kiddos (well, 2 anyway), I get dressed, I get in and out of bed, I go up and down the stairs… you get the idea. Now, imagine that a car accident left me suddenly with a spinal cord injury and I needed to use a wheelchair… How would all of those things happen?! Insert Occupational Therapy. For a child with a disability, social skills, turn taking, playing, climbing on a jungle gym, learning to get dressed, writing, coloring, reading… these are the work of the day… these would be their meaningful occupations. And yes, some children actually need to learn how to play, some even need to learn how to use their imagination! In some instances, we work to fix or rehabilitate what is not working. In other cases, we compensate, or find something to help, what is not working so that a person can be as independent as quickly as possible. In most cases, it’s a combination of both. Because of this, I think, we often get “lumped” in with Speech Therapy or Physical Therapy, sometimes even Special Education and Social Work. Truth is, all those professions should be working together to get the whole job done anyway! Occupational Therapy, known as OT, is a rehabilitation profession that helps people with illness or injury do what it is they want, need and love to do. For more official information on Occupational Therapy, be sure to check out the American Occupation Therapy Association.